DAFF’s Abalone Plan: There is NO Plan! The New Age newspaper today reports that according to the Department of Fisheries, abalone right holders should not worry as their fishing rights will be allocated before 31 July 2014 when these rights expire. According to the Department's Lionel Adendorf, the department is awaiting advice from their scientists because of the precarious biological state of the abalone resource. It is dishonest and disingenuous statements like these that result in widespread anger and backlash against the department such as we recently witnessed with the failed 2013 fishing rights allocation process. Instead of admitting failure with respect to developing and implementing a fishing rights allocation process for the abalone sector, we are again saddled with this unconscionable spin. First, we were told by the woeful Tina Joemat-Pettersson that abalone right holders will be allocated red steenbras to fish! When that laughable statement was exposed for the lie it is, we are now told that rights will be allocated before expiry in 45 days' time! What ridiculous nonsense will they expect the fishing industry to swallow next? The department appears hell-bent on deepening the various crises already afflicting the fishing industry by refusing to acknowledge their failures and limitations. The fact is, more than 300 abalone fishing rights will expire on 31 July 2014 and the department has once again simply not developed a plan, timetable or any process to cater for the re-allocation of these fishing rights. To compound the problem, the department's own legal review report on the 2013 fishing rights allocation process confirms that at least 3 years is required to properly and effectively develop and implement a fishing rights allocation process - NOT 45 days! So, the department must - FOR ONCE - be honest with itself, our fishing communities, the abalone industry and the South African public. What is it going to do in the next 45 days to ensure that abalone fishers are not abandoned and more socio-economic harm thrust upon our small-scale fishing communities? What we certainly do not need is more dishonesty and pie-in-the-sky solutions that can only result in failure ... AGAIN. We require tangible, lawful and practical solutions that take into consideration the investments by right holders, our international markets and pertinently the social and economic interest of our fishing communities that rely on abalone fishing. The only possible solution is an urgent Parliamentary amendment to section 18(6A) of the Marine Living Resources Act to make provision for the extension of abalone fishing rights beyond 31 July 2014. The 31st session of the FAO's Committee on Fisheries (COFI) began on 9 June 2014 in Rome with discussions on the adoption of a Voluntary Guidelines for Securing Sustainable Small-scale Fisheries commencing on the morning of 10 June 2014. Given South Africa's recent (and unlawful) 2013 fishing rights allocation process involving small-scale fishery sectors, which has caused sugnificant harm to small-scale fisheries and the communities dependent on these fisheries, the FAO Guidelines are particularly relevant and - we hope - force the Fisheries Department to review how it continues to mismanage our small-scale fisheries. 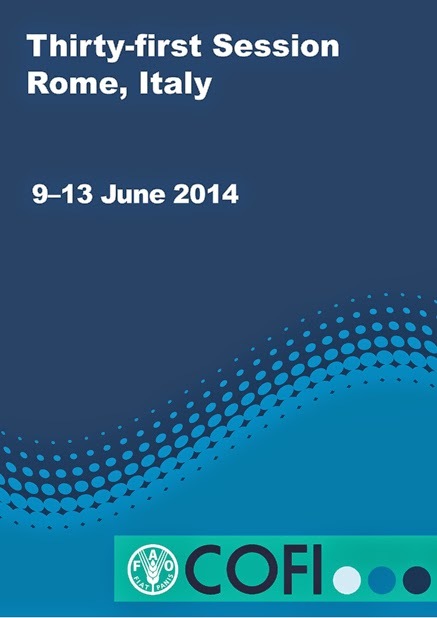 We have provided the link to the complete draft text which is being debated in Rome this week by COFI. It is not at all clear what South Africa's position is with respect to the final draft text being debated in Rome this week. It must however be noted that the Guidelines are broadly complemented by South Africa's 2012 Small Scale Fisheries Policy. But this Policy remains unimplemented and without any known implementation plan, budget and committed resources (such as available quotas or adequate personnel to oversee implementation of the Policy). Further, some of the key tenets of the Small Scale Policy (reliance on allocating more small scale fishing quotas despite contracting TAC's, relying on small-scale fisheries for job creation and allocating rights to "communities") are directly contradicted by elements of Chapter 6 of another Cabinet approved policy document - the National Development Plan. In light of this policy schizophrenia, it remains unclear what South Africa's position will be on adopting the Voluntary Guidelines for Securing Sustainable Small-scale Fisheries. This article therefore seeks to only highlight certain key themes and principles that are particularly relevant to the current crises afflicting the management of our small-scale fisheries and how these impact right holders, fish workers, coastal communities and crew. Once adopted by the FAO community, the Guideline will be a voluntary instrument (like the 1995 Code of Conduct for Responsible Fisheries) and will complement current FAO instruments. In particular, the small-scale fisheries Guideline will be premised on the principles of equitable access to fish resources, resource sustainability, basing decision-making on the best available scientific evidence, the precautionary approach and focusing on the recovery of over fished resources. The Guideline recognises the importance and relevance of the territorial user rights fishery management system, encouraging states to implement laws to ensure that small-scale fishers, fish workers and their communities have secure, equitable, and socially and culturally appropriate tenure rights to fishery resources and small-scale fishing areas and adjacent land, with a special attention paid to women with respect to tenure rights. that small-scale fishers have both rights and responsibilities, and are obliged to protect and conserve fishery resources for present and future generations. The Guideline furthermore states that, "States should facilitate, train and support small-scale fishing communities to participate in and take responsibility for, taking into consideration their legitimate tenure rights and systems, the management of the resources on which they depend for their well-being and that are traditionally used for their livelihoods. Accordingly, States should involve small-scale fishing communities – with special attention to equitable participation of women, vulnerable and marginalized groups – in the design, planning and, as appropriate, implementation of management measures, including protected areas, affecting their livelihood options. Participatory management systems, such as co-management, should be promoted in accordance with national law." States are obliged to avoid policies and financial measures that may contribute to fishing overcapacity and, hence, overexploitation of resources that have an adverse impact on small-scale fisheries. In this regard, policies that seek to add to the number of fishers that target collapsed and overexploited stocks such as lobsters and line fishes should be abandoned. Pertinently for South Africa, States must ensure adequate social security for small-scale fishers taking into account seasonality and other factors peculiar to small-scale fisheries management. With respect to climate change and stock recovery, the Guideline reaffirms the international community's commitment to the concept of ‘building back better’. In this regard, South Africa has previously committed to the recovery and rebuilding of all collapsed and overfished fisheries by 2015 - a goal we will certainly not be able to achieve in small-scale fishery sectors such as lobster, line fish and abalone. Finally, with respect to transparency and accountability, the Guideline stipulates that all States should recognize the importance of communication and information involving fishers and fishing communities, as these are crucial for effective decision-making. The Guideline makes it clear that States should endeavour to prevent corruption, particularly through increasing transparency, holding decision-makers accountable, and ensuring that impartial decisions are delivered promptly and through appropriate participation and communication with small-scale fishing communities. This obligation is rather ominous for South Africa given the most recent allegations and revelations of widespread corruption, secrecy and maladministration afflicting the 2013 fishing rights allocation process and a number of recent decisions concerning small-scale fisheries and the transfer of commercial fishing rights. The City Press confirmed on 8 June that the controversial former acting head of fisheries, Desmond Stevens, is the target of a Hawks investigation into allegations that he demanded millions of rands from fishermen in return for fishing rights allocations. Paul Ramaloko, spokesperson for the crime-fighting unit, told City Press that the investigation had been ongoing for more than a year. Read the full story by journalist Moyagabo Maake here. 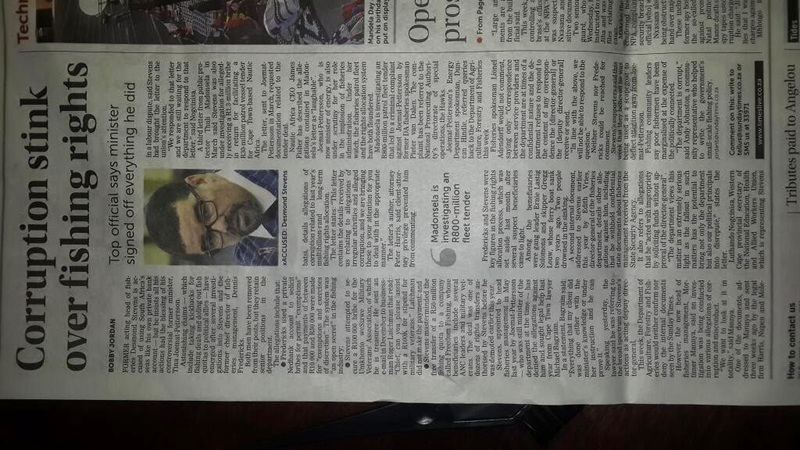 The Sunday Times and City Press newspapers today confirm what we at Feike have been alleging for some time - that the 2013 fishing rights allocation process and our fisheries management administration under the leadership of Tina Joemat-Pettersson and her self-appointed cadre, Desmond Stevens, has descended into a cesspool of corruption and the illicit and unlawful allocation of multi-million rand quotas to ANC cadres. The Sunday Times reveals that it has an email in which Stevens openly solicits a bribe of R100,000. In terms of the Prevention and Combatting of Corrupt Activities Act, the content of this email would almost certainly amount to an illegal gratification in terms of the Act. Conviction on such a charge carries a sentence of 15 years imprisonment. And then there are the illicit transfer of the fishing rights to the many ANC cadres, "community" representatives and connected few. Stevens' inexplicable conduct when allocating fishing rights (as confirmed by the Harris, Nupen Molebatsi Report) of course is further confirmation that legality and good governance did not underpin the 2013 rights allocation process. And then there is that Dennis Fredericks character. Fredericks' history of bad and suspicious decision-making at the fisheries department in the 1990's, which ultimately led to his removal from the department in 2004, is of course legendary. And how can we forget his disastrous involvement as a "consultant" to a number of fishing companies in the 2005 rights allocation process, which resulted in the catastrophic implosion of a black-owned and successful fishing company. That he was re-employed by the Fisheries Department after this history only confirmed the parlous state of governance at the Fisheries Department. And now, true to form and as predictable as a sand-storm in the Sahara, the Sunday Times reveals that Mr Fredericks has been running a private Nedbank account into which bribes were paid for "permit exemptions". Bribes of between R10,000 and R50,000 appear to have been paid into this account according to the Sunday Times. As with Mr Stevens, such conduct would be illegal and a contravention of the Prevention and Combatting of Corrupt Activities Act. Conviction on such a charge also carries a sentence of 15 years imprisonment. So, instead of responsibly managing our fisheries and "empowering" coastal communities and "transforming" the fisheries sector, what is plainly apparent is that these incompetent and unqualified cadres were sinking the fisheries department, the communities that were supposedly to benefit from quotas and our fisheries resources. The question is what is being done to fix the Fisheries Branch now? The only thing we know is that according to the new DDG of Fisheries, Mortimer Mannya, there are investigations into "various allegations of corruption and misconduct." But, the Fisheries Department continues to remain silent on what is being done to set side the 2013 FRAP and what the proposed timetable is for the re-allocation of these rights. Not to mention the loud silence around the abalone rights allocation process which ought to be full-swing now (rights to be re-allocated by July 2014). And what about the intended 2015 rights allocation process which will certainly have to be postponed by at least 3 years now? Again silence. What is apparent and increasingly undoubtedly clear, is that the department is presently mired in infighting, investigations, corruption and maladministration. The pool of skilled fisheries managers capable of designing and implementing a lawful and proper rights allocation process is simply non-existent. In other words, there literally is no one at DAFF who knows how to design and implement a process that can result in the re-allocation of multi-billion fishing rights. 4. Amend Section 18 of the Marine Living Resources Act, 1998, to allow for the roll-over of the 2015 fishing rights allocation process. Not only is there not enough time to prepare for such a process in 12 months' time, but the stench of corruption, maladministration and shocking lack of governance and available skills to undertake such a complex process simply precludes the commencement of any processes related to another fishing rights allocation. We simply cant afford a repeat of the corrupt, tainted and illegal 2013 FRAP. The Second MLRA Amendment Act: And Down the Garden Path We Go Again! The Second Marine Living Resources Amendment Act was signed into law by the President on 19 May 2014. The Amendment Act essentially replaces the term "subsistence" in the original version of the Act with the term "small-scale commercial" and makes provision for fishing rights to be allocated to co-operatives or rather to members of coastal communities who will be herded into "fishing co-operatives" on the promise of untold riches and access to ocean's wealth. In other words, a social-welfare system using what fish we have left in our waters to placate the growing unemployed and unemployable! Feike has previously stated (and we repeat (siiigghh) that the allocation of high-value commercial fishing rights on a "co-operative" basis has been shown to be a profound failure in this country. What our history shows us is that where community-based fishing allocations have been previously attempted, it only led to massive overfishing, intra-community strife and corruption. The Public Protector's office is currently investigating allegations by members of fishing communities such as Stanford where the community has been split down the middle resulting in substantial conflict with allegations of corruption and nepotism against the departmentally anointed "community-leader" who has taken it upon himself to decide who gets to share in the quotas and who does not. The communities of Doringbaai and Ebeneser on the West Coast are another classic case. And further north, the isolated community of Hondeklipbaai is yet another. Feike has again and again asked why the Fisheries Department is insisting on allocating fishing rights to co-operatives when the department's own "flag-ship" co-operative project is an abject failure in Doringbaai. And of course the epitome of failure, the South African Commercial Fishermens Co-operative (SACFC), which left more than 3000 fishermen from coastal communities destitute because of an insistence to allocate quotas on a "co-operative" basis. When asked to give examples of successful co-operatives during the Parliamentary hearings on the Amendment bill, the Department's Dennis Fredericks had the audacity to point to the agricultural sector! Which of course is like comparing the proverbial chalk and cheese. So what would motivate those that are such ardent supporters of this "co-operative" project to persist given the history and current experiences of community conflict and failure? Could it be that what is profoundly evident from, but common to each of these failed experiments is that some connected individuals who get in at the "ground floor" as it were stand to make a huge amount of money while the sheeple that make up the "community" get screwed? Who benefited from the SACFC pillage? Who is actually benefitting from the interim relief quota allocations in Stanford and other Southern Cape villages? Certainly not the "fishermen" or the "community" as they remain as poor as ever. And of course if anyone at the department of fisheries actually understood fisheries management and its complexities, they would be asking themselves why are the best and most sustainably managed fisheries around the world managed in terms of individual quota management regimes and not this failed system of "co-operative" quotas? What makes the pursuit of excellence and success so reprehensible to these decision-makers in the department? Just as we warned about the impending failures of the FRAP 2013, we warn about this blind insistence to allocate quotas to co-operatives in the face of a history of failure. Why are still trying to debate whether the best shape for the wheel is a circle with the Fisheries Department and its ideologues insisting that the square is superior? I put this question to the Fisheries Portfolio Committee when this amendment bill was being debated but of course they refused to address the issue. Who will face the starving fishermen and their families when these co-operative projects all fail dismally ... again?